The above are photos I took of the Colombian minga at the end of their long march, as it was coming in to the heart of Bogotá in November of 2008. I have posted before about the term minga, so forgive me for going off about it again, but I continue to be frustrated that a lot of interps and translators are just leaving minga as minga into English, which I think will not make sense to most readers and loses some of its power. Yes, it is a powerful and complex enough word that we should work on importing it (like we have campesino) and educating English only listeners as to what a minga is, but to do that you have to add a quick simplified definition when you use it. I propose adding collective work action the first few times you use it. "Minga is a Quechua word meaning “collective work” with wide currency among popular and poor sectors, both indigenous and mestizo, of the Andean republics. 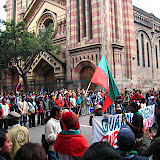 The Cauca-based minga of 2008 was grounded in the territorial and cultural demands of Colombia’s indigenous peoples, yet it is a movement that now extends across the Andes, engaging indigenous and non-indigenous sectors in Colombia, Ecuador, Bolivia, and Peru (see “Against the Law of the Jungle"). Minga, however, is a concept that has traveled not only because of the “natural” cultural solidarities that run through indigenous ideals of community life, but also because Andean authorities long ago found in the minga a useful means to organize corvée labor, first in colonial mines and then later for the roads and public works that would provide evidence for the state’s presence in their nations’ otherwise forgotten indigenous territories. Thus the ACIN’s call to join in minga, as a name for a collective action that is at once local and international, gains force from both its cultural and historical references to a shared experience of subjugation. By calling their movement a minga, the indigenous participants call attention to both the work that must go into politics and the idea that that work must be collective. They also, of course, reclaim it from long histories of state-led attempts to organize and control collective politics and community organization."